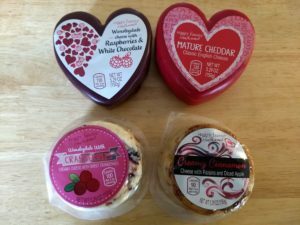 Aldi offers plenty of Valentine’s Day fare ranging from whole lobster to pasta to sweets and chocolates, as well as wine. 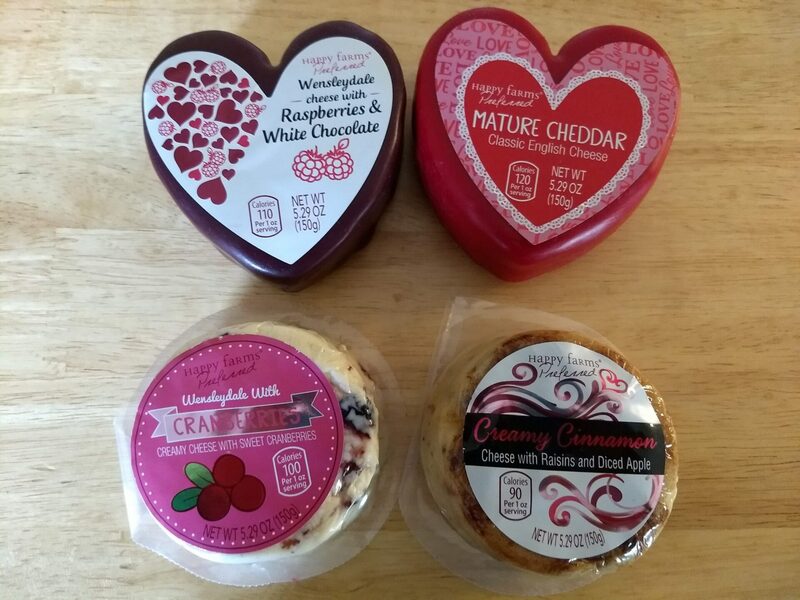 The discount grocer also sells the Happy Farms Preferred Valentine’s Day Cheese Assortment, which includes four varieties of artisanal cheese, many with a sweet flavor. 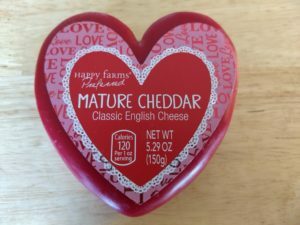 Some of the cheese comes packaged in a heart-shaped Babybel-style wax covering — looking a bit like the classic box of Valentine’s chocolates — for extra ambiance on what is perhaps the most romantic day of the year. These are more upscale cheeses, not really comparable to the standard grocery store blocks of orange cheddar. They’re ideal for pairing with wine, crackers, fruit, and other hors d’oeuvres and would make a great cheese board to serve at a party. 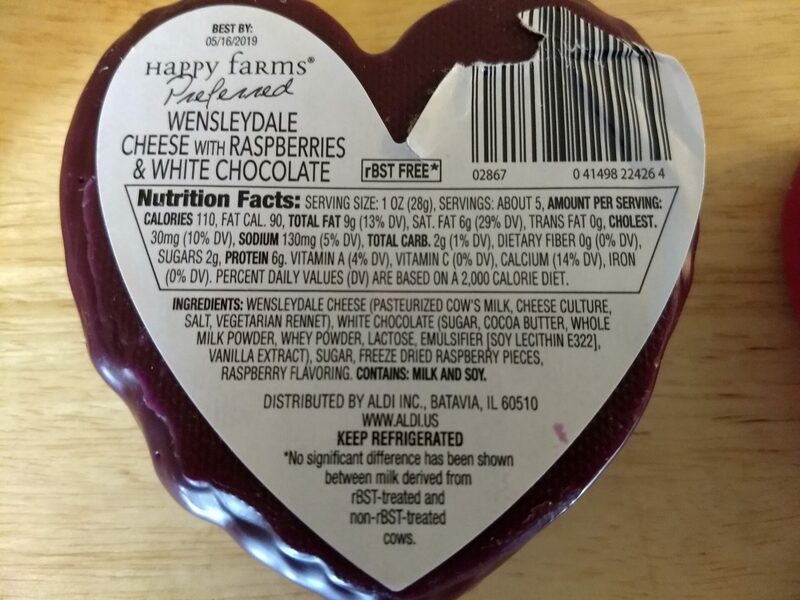 This is marketed as a “Classic English Cheese.” It comes in a heart shaped and is covered in red wax, and you can watch a useful video at this link that shows you how to remove the wax without ruining this cheese’s heart shape. This cheese contains: pasteurized cow’s milk, salt, cheese cultures, and vegetarian rennet. One serving equals one ounce, which nets you 120 calories, 6 grams of saturated fat, 200 mg of sodium, and 0 carbs. It also has 7 grams of protein and 20% of your daily value of calcium. My husband and I enjoyed this cheese. It has a sharp cheddar flavor, and it has a more sophisticated texture and taste — and is maybe a bit more dry or crumbly — compared to Aldi’s regular cheddar blocks. It’s a solid snacking cheese in small quantities because it is so rich. 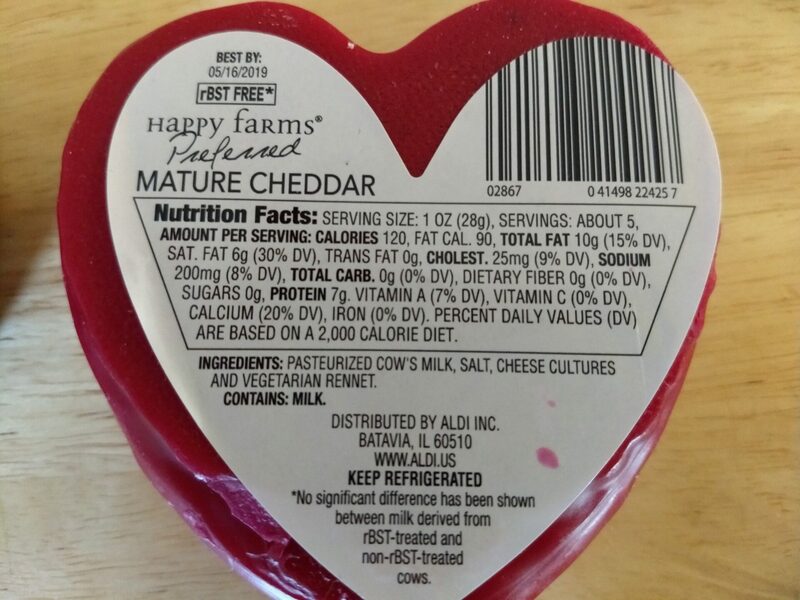 This cheese also comes shaped like a heart and packaged in purple wax. 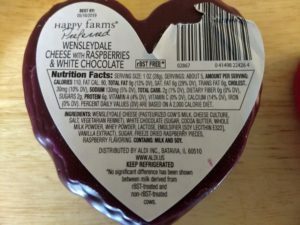 Ingredients are: Wensleydale cheese (pasteurized cow’s milk, cheese culture, salt, vegetarian rennet), white chocolate (sugar, cocoa butter, whole milk powder, whey powder, lactose, emulsifier [soy lecithin E322], vanilla extract), sugar, freeze dried raspberry pieces, and raspberry flavoring. A one-ounce serving gives you 110 calories, 6 grams of saturated fat, 130 mg of sodium, and 2 grams of sugars. It also has 6 grams of protein and 14% of your daily value of calcium. This cheese is different, and interesting. It has a slightly crumbly texture, and it’s definitely a dessert cheese. It’s sweet, and I crunched on several raspberry seeds while eating it. My 7-year-old liked this cheese and asked for a second helping. It may be a bit of an acquired taste. The more I ate, the more I liked it. The good part is that, if you need to satisfy a sweet tooth, there are only 2 grams of sugar in one serving. 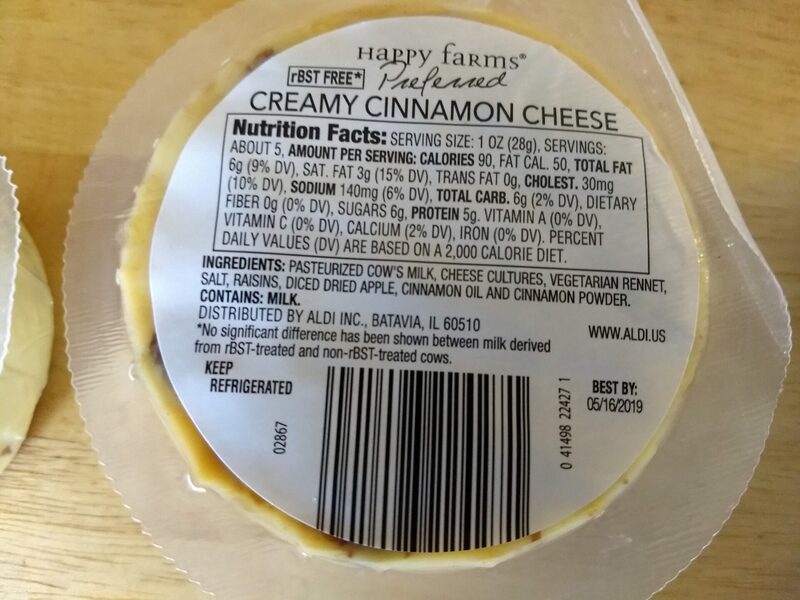 This cheese contains: pasteurized cow’s milk, cheese cultures, vegetarian rennet, salt, raisins, diced dried apple, cinnamon oil, and cinnamon powder. One one-ounce serving contains 90 calories, 3 grams of saturated fat, 140 mg of sodium, and 6 grams of sugars. It also has 5 grams of protein and 2% of your daily value of calcium. 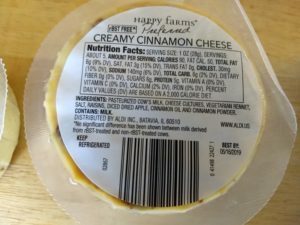 This cheese is unlike any I’ve ever tried before, with large chunks of raisins and apples. 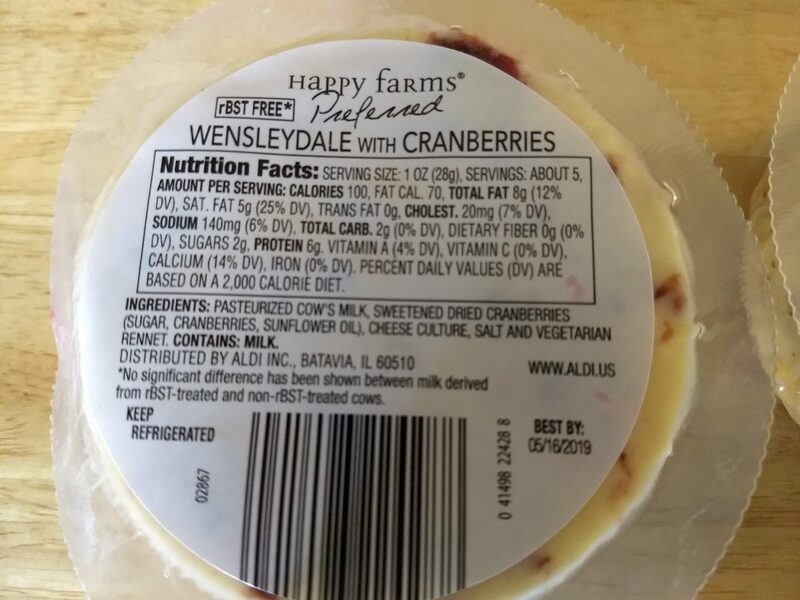 It’s another good dessert cheese, but I still prefer the Wensleydale cheese with raspberries and white chocolate, mostly because I’m not a big raisin fan. My kids and husband didn’t care for this cheese. If you’re a dedicated cheese aficionado and you like fruit, though, you may like it. 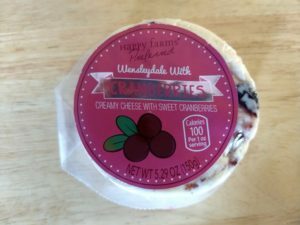 It contains: pasteurized cow’s milk, sweetened dried cranberries (sugar, cranberries, sunflower oil), cheese culture, salt and vegetarian rennet. A one-ounce serving nets you 100 calories, 5 grams of saturated fat, 140 mg of sodium, and 2 grams of sugar. It also has 6 grams of protein and 14% of your daily value of calcium. I thought this cheese was okay. It has a hint of sweetness because of the cranberries. My kids were “meh” on this one, and my husband did not like it. 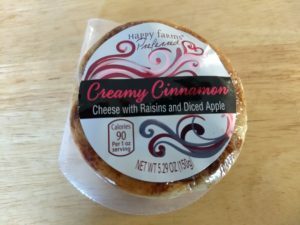 My husband felt like the flavor combinations for this cranberry cheese and for the cinnamon/raisin/apple cheese mentioned above were too exotic or unusual for his palate, which is saying a lot because he is the biggest cheese fan in our family. 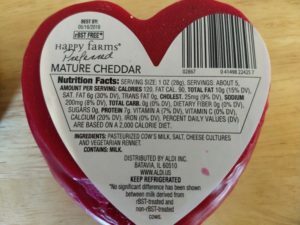 The ALDI Find (Special Buy) Happy Farms Preferred Valentine’s Day Cheese Assortment gets credit for looking cute because some of the cheeses are heart-shaped and packaged in red and purple wax. The cheese collection also gets props for some creative flavor combinations, but those combinations have some mixed success. 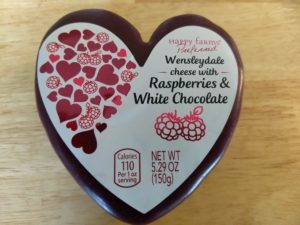 My family enjoyed the Mature Cheddar Cheese, and, while it was unusual, we also liked the Wensleydale Cheese with Raspberries and White Chocolate. 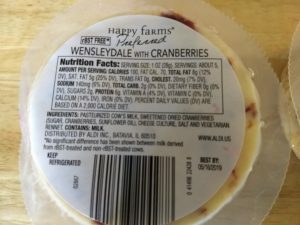 We didn’t care much for the Creamy Cinnamon Cheese with Raisins and Diced Apple or for the Wensleydale with Cranberries. That all said, your experiences may be different, especially if you’re looking to pair your cheeses with crackers and wine. So if you’re looking to pick up these cheeses, you might also experiment with some other things to try alongside them.